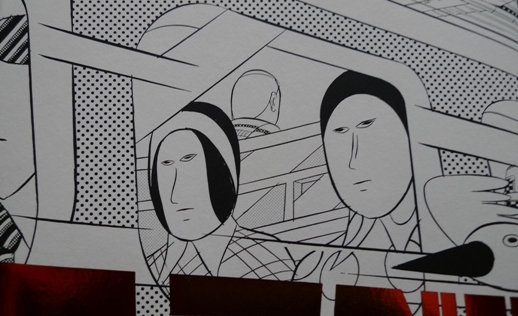 A compelling look at contemporary transportation in a manga for our times. No rail system boasts as many lines, interconnections and crossed paths as Tokyo. Although Mexico City moves more people per day, one can certainly say that the train car environment in Japan is, for the most part, sterilely clean and markedly speechless, free from the boom-boxes, squeeze boxes and soapboxes that detract or enrich other countries’ rail systems. Things move efficiently most of the time and the relatively high level of hygiene makes tight quarters more bearable. But how do we interact, if at all, on trains? 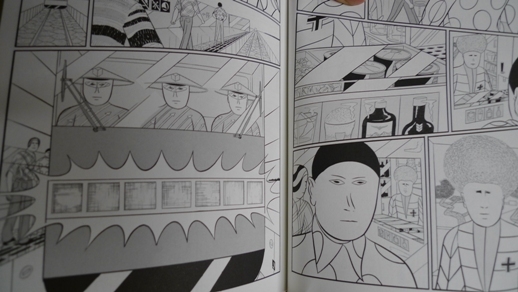 In Yuichi Yokoyama’s painstakingly constructed manga “Travel” one encounters a postmodern world through a wordless train society. On trains we engage in superficiality; it’s all we can do. In fact, rather than the careful verbal maneuvering such as that which takes place in the office or the bar, on the train we engage in a purely visual assessment of people around us. 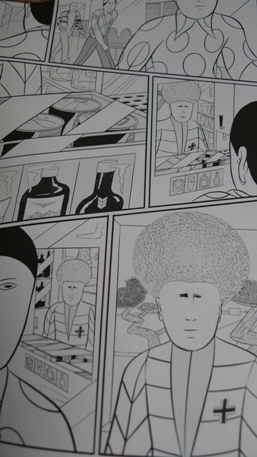 Yokoyama is known as a painter as well, but this foray is on the printed page. His extreme attention to mise en scene in the cell renders words unnecessary and conveys an amazing unique modern society, one that feels like a Kraftwerk-inspired engineer-sociologist-cynic’s dream. The world of unspoken image exchanges, of the gazer and gazed, interactions that we cannot pin down with an utterance; the visual (architectural, fashion, facial) features that operate in that world. With about ten years of planning and three years of work, “Travel” rewards the reader who searches these deceivingly simple images for a world bearing traits of our own. Maybe we’ve never paid attention to the latticed concrete hillsides outside, the way I sized-up that guy or girl, the flashes of light from an oncoming train at night or the way rain streams horizontally across the window in amoeboid tendrils. But Yokoyama has nailed these things down in his own semiotics of the rails. He solidifies a range of certain looks, glances, wayward gazes and hidden peeks that form the most substantive human interaction in this anonymous place. He captures moments that we easily miss in his own linearly engineered universe. But don’t be mislead, this is not a documentation of Japanese trains or Japanese society exactly. The settings and inhabitants appear quasi-European (but don’t most characters in manga? ), although in a non-stereotypical way. Everyone’s features are reduced to a strange set of nose, mouth, eyes, hairstyle and clothing. Shapes appear at first to be just random abstraction but as you read on you realize this stylization is more of a distillation and minimization of those features that we classify people all the time tinged with the sardonic. This visual style is effective in articulating our superficial engagement with an over-populated urban environment. At its core, “Travel” is the journey of three people from one place to another – from rural toward urban landscapes. The society has recognizable elements of Japanese life but works more as meta-manga, explicating the medium’s euro-centric depictions of people through their overt simplification. It conveys more without words than any attempt by the most contemporary jargon. This manga is truly a work of art, which, unlike so much contemporary art’s denial of an interpretive gaze, actually yields a critical stance. A must for those of us who travel on trains regularly, this nice dose of irony points out the nuances of inter-train life. Available from Aoyama Book Center, NADiff and other outlets, priced 1,141 yen plus tax.